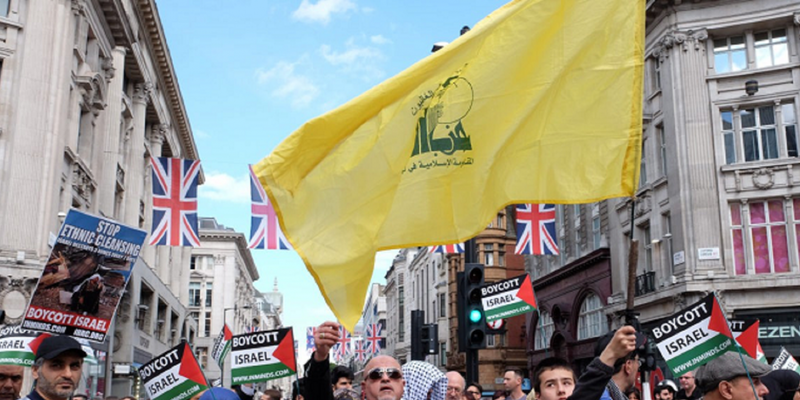 On Sunday 10 June the flag of Hezbollah will be flown during an Al Quds Day march in London. The flag will be allowed by London police because the UK has banned Hezbollah’s military wing, but has not done so for its political wing. However, by their own admission the political and military operations of the Shi’a organisation are one and the same. A closer look at the flag itself reminds us that this terrorist organisation represents an ideology that should not be promoted on our streets. The flag of Hezbollah, while sometimes found in different colours, is usually composed of the green logo upon a yellow background with text above and below the logo in red (or sometimes green). The logo is a stylised representation of the Arabic words حزب الله ḥizbu-llāh (meaning “Party of Allah”) in Kufic script. The letter “A” of “Allah” is linked to the upraised arm grasping an AK-47 assault rifle, which signifies the ideological legitimisation of the movement’s militancy as being divinely sanctioned. The arm grasping the rifle signifies the martyrdom of Imam Husayn, who is the grandson of the Muslim prophet Mohammed, and links it to the militancy of the movement today, a poignant reminder that Hezbollah’s so-called political motives are intrinsically tied with its militant mission. The logo also incorporates several other objects, namely a globe, a book, a sword, and a seven-leafed branch. The globe represents Hezbollah’s desire to see its Islamic ideology ultimately prevail throughout the world. The text above the logo reads فإن حزب الله هم الغالبون and means “Then surely the party of Allah are they that shall be triumphant” (Quran 5:56), which is a reference to the name of the party. Underneath the logo are the words المقاومة الإسلامية في لبنان meaning “The Islamic Resistance in Lebanon”. The symbolism of Hezbollah’s flag points to the Islamic Revolution that was inspired and encouraged by the Ayatollah Khomeini subsequent to Iran’s 1979 Islamic Revolution. Its purpose is to export the Islamic Revolution throughout the world. Demonstrating its fealty to continuing the Islamic Revolution of Iran, Hezbollah designated the Ayatollah Khomeini as the Shi`i Faqih, or Supreme Religious Guide, and described the Islamic Revolution as the “vanguard” that “laid the foundation of a pan-Islamic state under the wise guidance of the fully qualified Faqih, Ayatollah Ruhallah Khomeini. The thoughts of Khomeini are taught at Hezbollah schools and indoctrination classes. Each year thousands of Hezbollah activists [go] on a visit to the tomb of Khomeini near Tehran. 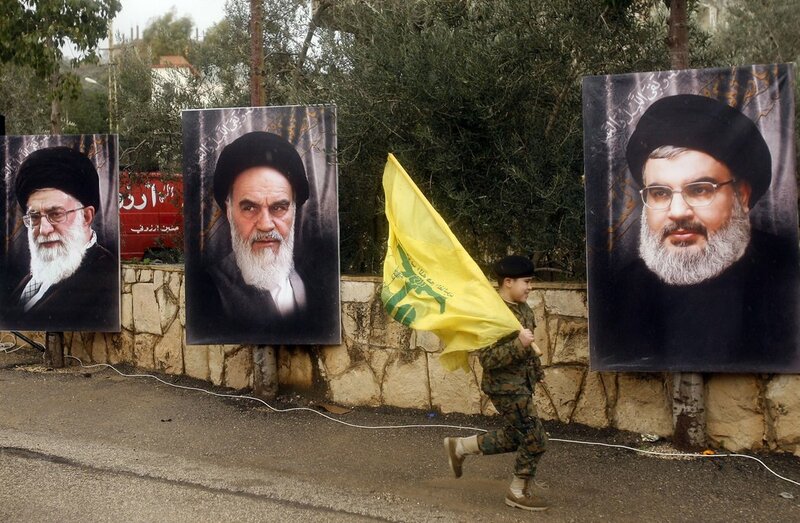 Hezbollah legitimizes its terror activities and suicide bombings by relying on a radicalised interpretation of a core episode in Shi`i Muslim history. In 680 AD, Imam Husayn, the grandson of the Muslim prophet Muhammad. Followers of Hezbollah and the ideology of Ayatollah Khomeini paint Husayn as being a willing martyr and interpret this episode of their history as being the template for the Hezbollah suicide bombers of today. Hezbollah’s worldview is fueled by the perception that the Muslim world is experiencing a period of deep crisis and, as a result, members of the organization are encouraged to strike at the forces of evil in the world in order to accelerate a final apocalyptic confrontation between Muslims, who are characterized as the force of God in the world, and the West, which is characterized as the force of evil. From Hezbullah’s perspective, each of its terror attacks against the West is counted as an earthly action that assists the divine struggle against the Satanic forces of the world, personified by the West. The Obligation to War and Jihad Hezbollah anticipates that the final cumulative effect of its war against the West will bring about the establishment of a radical transnational Islamic state that, in time, will encompass the entire world. Ayatollah Khomeini delineated his vision of a radical Islamic state achieving such a goal in a tract that he wrote in 1942 entitled Kashf Al-Asrar (“Keys to the Secrets”). Hezbollah’s perpetuation of this ideology has resulted in a twenty-year history of attacks against Westerners, Israel, and Jews. The movement’s “spiritual mentor” is currently Shaykh Muhammad Husayn Fadlallah, and its secretary general is Shaykh Hassan Nasrallah. Over the past decade, Hezbollah has expanded its terror attacks against Israelis and Jews from the Middle East throughout the world. Hezbollah ultimately seeks to eradicate Western influence and promotes the cause of a Khomeinistyle Islamic revolution throughout the Middle East, and, ultimately, the world. Their flag should not be paraded in London’s streets.